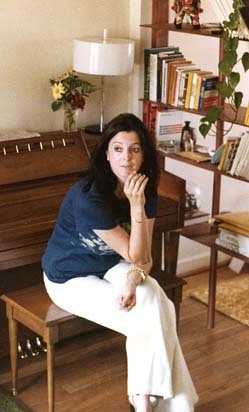 1977 Rosario in a thoughtful mood in the living room of Victoria's Fairlington townhouse in Arlington, Virginia. 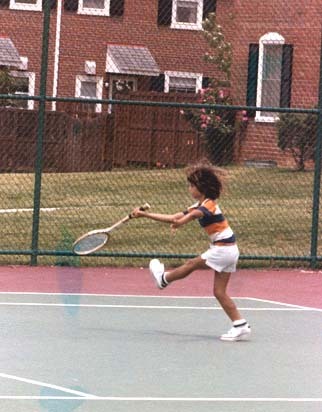 1977 Kiko, about 7 years old, already showing his great form at the tennis courts in Fairlington. 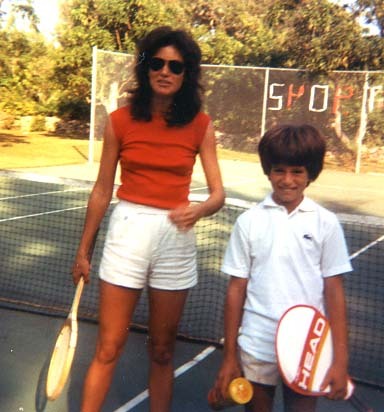 1977 Kiko and Constanza after a tough set on the courts in Fairlington. 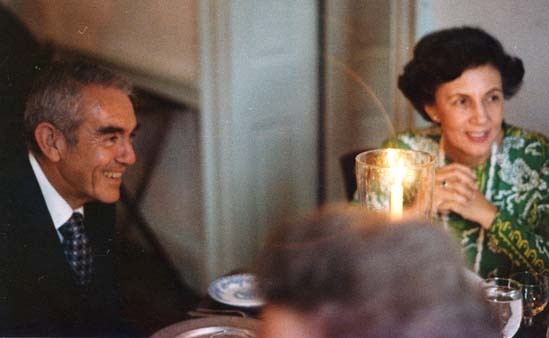 1977 Mom and Dad enjoying the rehearsal dinner for Victoria and Jim at Gadsby's Tavern in Old Town, Alexandria. This was a favorite stopover for George Washington on his way home to Mt. Vernon. 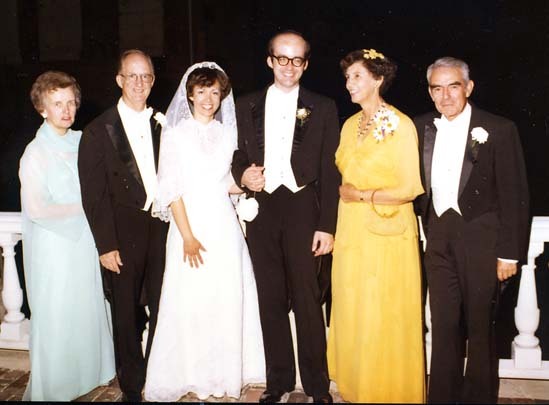 1977 Victoria and James Schoenberger are married on June 24th at St. Mary's Church in Old Town, Alexandria. Top row, L-R: Charles Masella, Danny Montana, Robert Schoenberger, John Freeman. 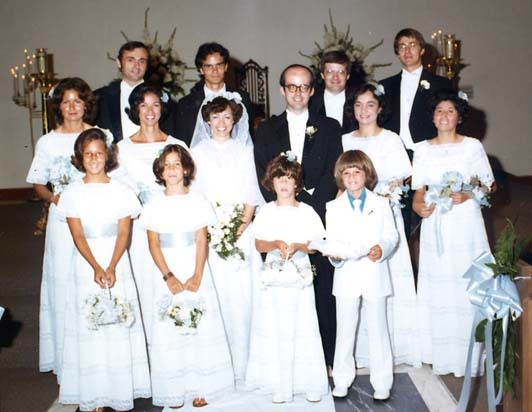 Middle: Constanza, Cristina, bride, groom, Marta Chiari, Carmen Alfaro. Front: Flower girls Lauren, Lisa, Carolyn, and ring bearer, Kiko. 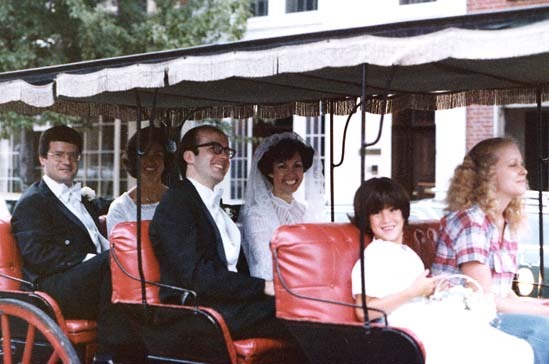 1977 Carolyn made a mad dash to catch up with the carriage and ride shotgun on the way to the reception. 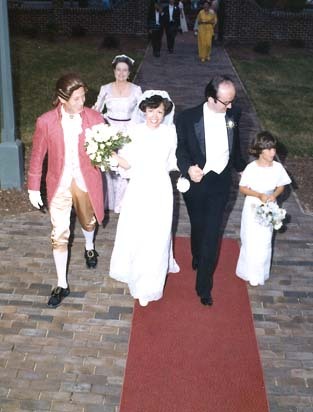 1977 Arriving at Carlyle House with Carolyn, we are greeted by "Mr. and Mrs. John Carlyle" in period dress. Carlyle was a wealthy merchant in the early 1800's. After the house was restored, our reception was the first social event held in the house, which also has a beautiful terrace and garden in back. We danced to the sounds of a string trio. 1977 The bride and groom's parents outside on the terrace at Carlyle House. 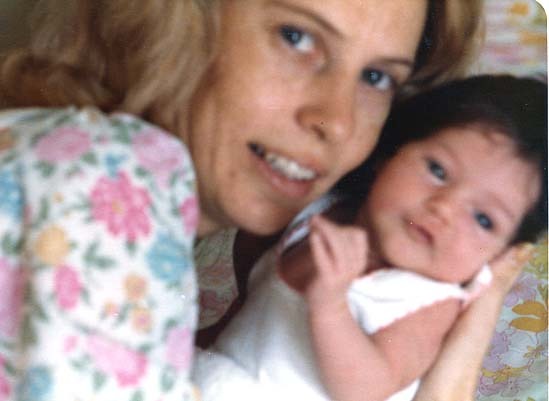 1977 Valerie and her firstborn, Monica, who arrived on April 3rd. 1977 Lots of dark black hair gives Monica that Montana look. 1977 This looks like a Sunday outing after church. Pacho and Rosario, their handsome twosome, and Mom walk in front of their So. Miami home. 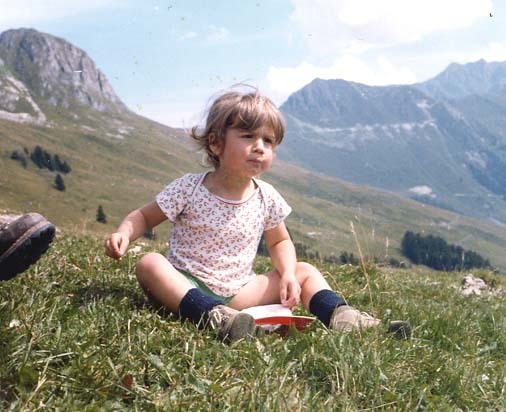 1977 Lara holding on to her papa Edgar's slacks enjoys the French countryside. Lara was born Oct. 22nd in Paris, France. 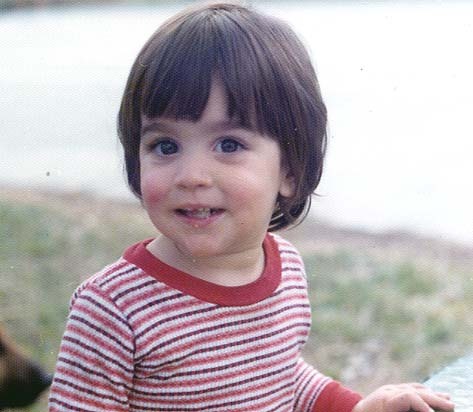 1978 Lara became an animal lover at a very young age. 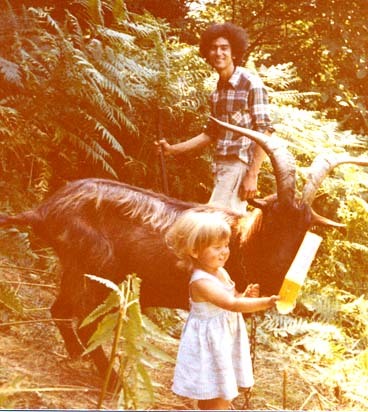 Here she is with the Billy goats that roamed all around their farm in southern France. Jim and Victoria visited, staying in Lacaune at the Hotel Fusie. During lunch at the farm, we tasted homemade goat cheese and other delicacies. Edgar made deliveries of his cheese to several nearby villages. 1978 Lara helps with some of the farm chores and has a wonderful time taking care of the animals. Edgar said it just came naturally to her. 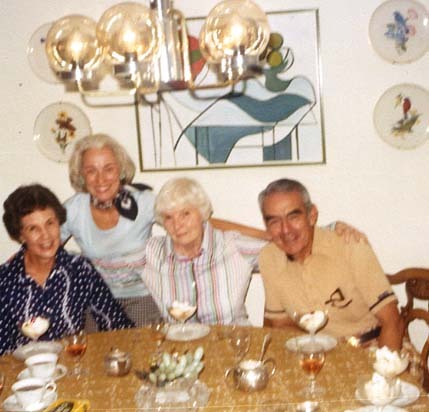 1978 Mom, Dad and two friends enjoy a snack in their condo on Biltmore Way. The Picasso art behind the chandelier is by Edgar. 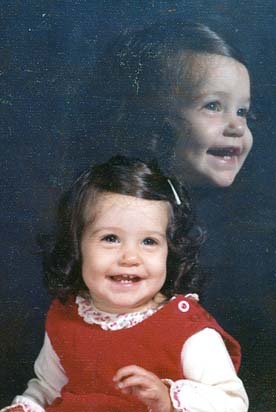 1978 Monica shows her big smile for the photographer. It's a winner! 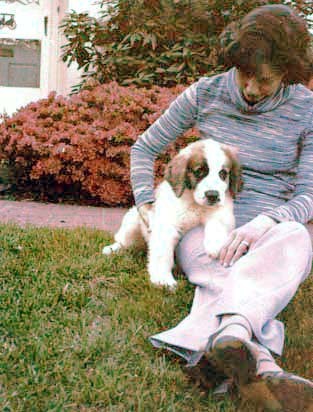 1978 Victoria and Bernie in front of our house on Surrey Hills Drive shortly after moving to St. Louis, Missouri. 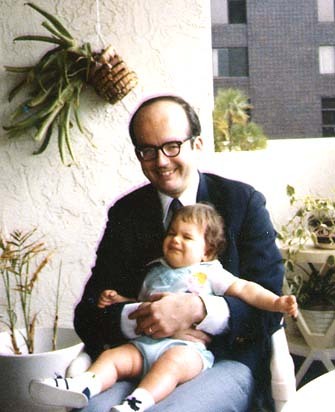 We lived in a suburb known as Richmond Heights, with beautiful gardens and trees. 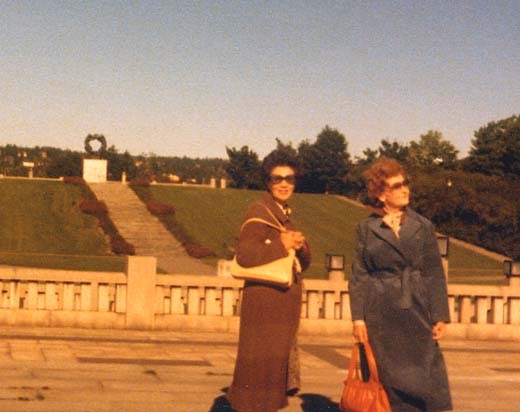 1979 Another view of Europe, this time to the Scandinavian countries. Mom and Gussie Woodard, longtime friend, admire the scenic landscape. 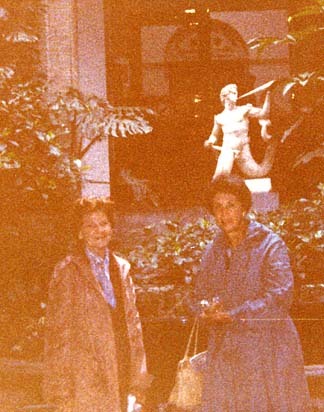 1979 Mom and Gussie enjoy the atrium of a palatial home. 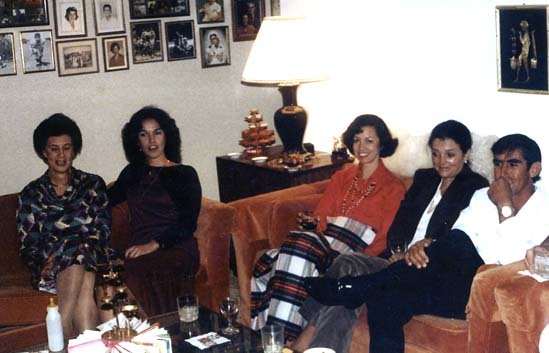 1979 After a tamale dinner, or was it arroz con pollo, we take it easy in the living room of Mom/Dad's condo on Biltmore Way. 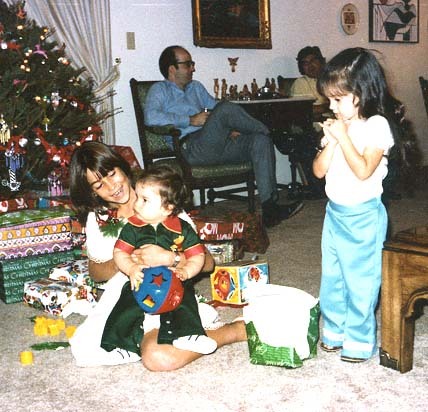 1979 David, born January 24th, in St. Louis, Missouri, enjoys his first Christmas with cousins Lisa and Monica, at the Biltmore condo. 1979 Jim and David on the terrace of the Biltmore Condo. 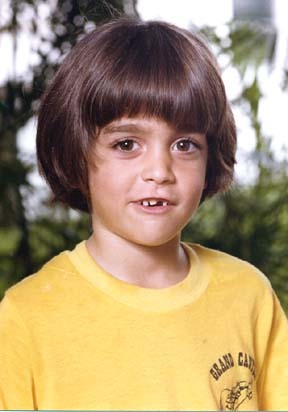 1979 Pablo's' smile is missing a little something, but hey, the eyes have it! 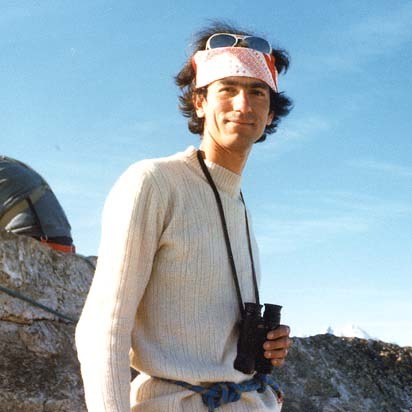 1979 Edgar, the mountaineer, hiking in the French Alps. 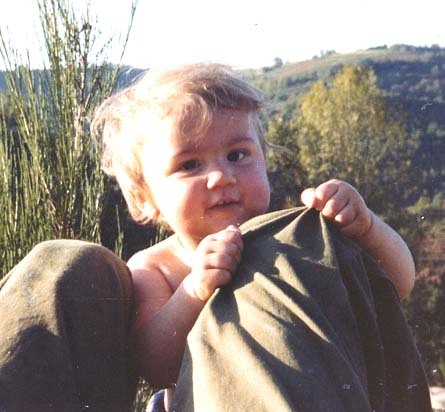 1979 Lara traveled to many distant lands, including Nepal, but here she enjoys the French countryside near her home.